Elite freelance network builds world’s first free, stand-alone time tracking app that puts full control in the hands of freelancers, regardless of the freelance platform they use. San Francisco, CA – January 14, 2016 - Toptal, the world’s leading network of elite freelance software engineers and designers, today announced the launch of TopTracker. 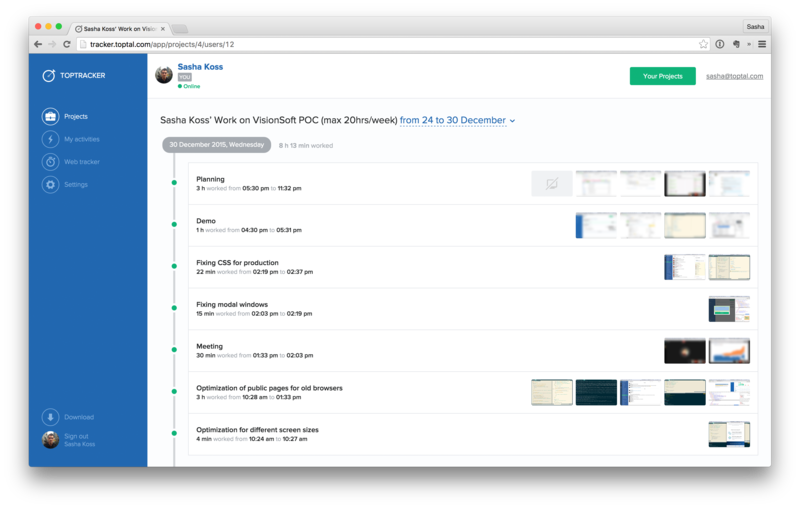 TopTracker is the first and only completely free tracking tool that helps remote teams track their time without being tied to a specific freelance marketplace. 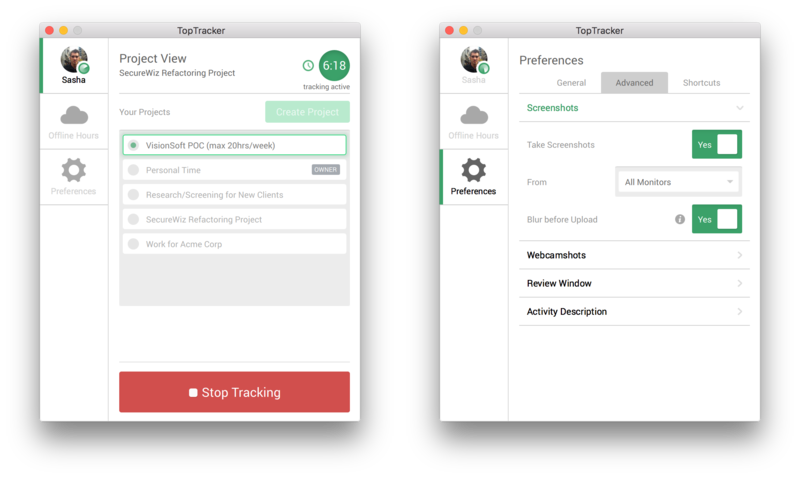 TopTracker is a standalone product and is free for all users, with a clean, elegant desktop and web app that helps freelancers and managers work with their teams effortlessly. With a comprehensive suite of controls for freelancers to choose their preferred tracking settings and a simple, minimal interface, TopTracker is designed get out of freelancers’ way once it’s set up, leaving them to focus on their work with no distractions. Freelancers have full control over what gets tracked and when, and have the option of simply tracking time, including screenshots or webcam pictures, and deciding if uploaded images should be blurred. The app also features detailed, real-time productivity reports for freelancers and managers to keep track of efficiency and use the insights to implement performance optimizations that would not have been evident otherwise. TopTracker includes a web interface and desktop apps for Mac, Windows, and Linux. Unlike the time tracking software in use on some freelance sites, TopTracker is a stand-alone app, operating completely independently of the Toptal platform. Anyone can now enjoy immediate and unlimited access to TopTracker, even if they are not members of the Toptal community. TopTracker is now available for download at www.toptal.com/tracker. 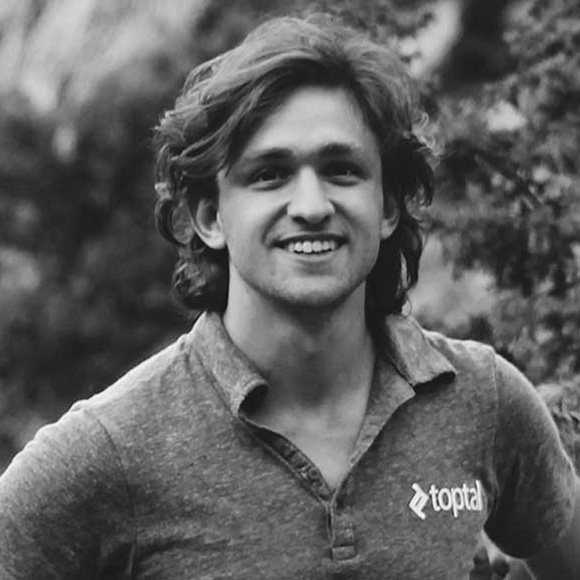 Founded in 2010, Toptal is one of the fastest-growing and most innovative companies to emerge from Silicon Valley. With backing from Andreessen Horowitz, Silicon Valley’s famed venture capital firm, Adam D’Angelo, founder of Quora, Ryan Rockefeller, and other investors, Toptal today connects thousands of elite freelance software engineers and designers from around the world to over 2,000 blue chips such as JP Morgan and Pfizer, tech companies such as Airbnb and Zendesk, and numerous startups to provide world-class solutions that meet the most complex and challenging requirements. Toptal’s rapid growth is testimony to exploding client demand and the unmatched quality and reliability of the company’s services.